This Presidents’ Day weekend, visitors have a last chance to see the remarkable Christo and Jeanne-Claude: Surrounded Islands, Biscayne Bay, Greater Miami, Florida, 1980-83 | A Documentary Exhibition at Pérez Art Museum Miami (PAMM), with the exhibition entering its final hours. Open since fall 2018, the exhibition showcases archival materials and artworks around the renowned artists’ site-specific 1983 installation, Surrounded Islands, in Miami’s Biscayne Bay. In May 1983, Christo and Jeanne-Claude encircled 11 manmade uninhabited islands in Miami’s Biscayne Bay with 6.5 million square feet of floating, pink, woven polypropylene fabric. For just under two weeks, the results harmonized with water, sky, and foliage, creating a vivid composition in blue, green, pink, and turquoise. Despite its short duration, Surrounded Islands made a lasting impact on the city’s cultural history, marking the rebirth of Miami’s international artistic profile while anticipating its rise as a hub for contemporary art. The exhibition at PAMM is an adaptation of an earlier exhibition focused on Surrounded Islands, which traveled through Germany, France, the Netherlands, Spain, Switzerland, Belgium, and Japan between 1984 and 1991. 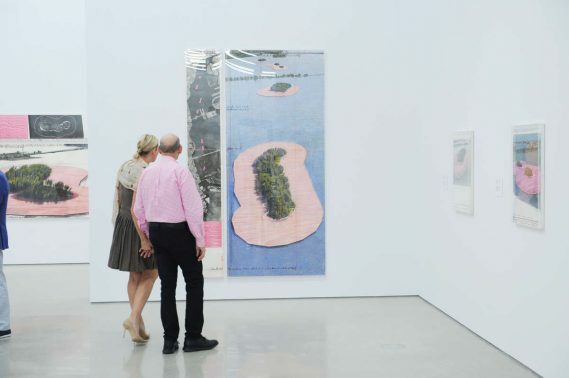 Like its precursor, the exhibition at PAMM of sweeping depth and breadth, features approximately 50 drawings and collages, a large-scale model of the bay and its islands, hundreds of photographs and documents, several photo murals, and physical components of the project.